Labyrinths are being built. Workshops are given. Programs are being developed for schools. TLS members all over the world are each doing their part to bring the labyrinth to a broad general audience. You can connect to information about a variety of these via the links in the lower area of this page. In order to extend an enhanced measure of support to our members’ activities, the Board of Directors decided to institute a Special Projects Committee in 2006, charged with oversight of a new Special Projects Program. The committee is now receiving, reviewing and approving application proposals from TLS members who are envisioning or currently organizing various labyrinth activities. If you are interested in serving on the Special Projects Committee, please contact the Special Projects Committee Chair. Be community based; that is, it must expose communities to labyrinths and to TLS. Be clearly and thoroughly defined, with those who propose it willing to shoulder most of the work. Project organizers interface with The Labyrinth Society through the Special Projects Chair and remain accountable to the Board of Directors for the life of the project. All members are eligible and encouraged to propose Special Projects. Below are some examples of past and present Special Projects that have been endorsed by TLS. A beautiful labyrinth was built at Kingston Episcopal Parish in Mathews, Virginia under the direction of Mary Chapman. TLS provided a $500 grant to assist in the cost of excavation and preparation of the land to be performed by a licensed contractor: sand, gravel and pavers will be used. The congregation provided the labor to install labyrinth. It was amazing to watch everyone work together to create this work of art that will be enjoyed by the community for years to come. On a prepared circle of crush and run....Parishioners moved about 11 tons of stone dust by wheelbarrow and shovel and carried and placed over 1300 pavers....they raked and leveled and swept in a sequence of cooperation that was wonderful. The written prayers have been incorporated into the labyrinth and any additional prayers will be added to the surrounding space. Over 30 volunteers in the community of Mancelona, Michigan under the direction of Ellen Whitehead came together to build the Mancelona Labyrinth of Hope. The community in beautiful Northern Michigan has suffered in recent years from the economic recession of the past decade, manufacturing job leaving the country, and businesses shutting up in our small downtown. But our people are resilient and still have hope in their hearts for a renaissance to begin in our town—and it has! Our labyrinth has already touched many people of all ages, both community residents and tourists who visit the area. The $500 grant received from TLS enabled three individuals receive facilitator training so they can further educate the community and facilitate labyrinth events. TLS provided a $250 grant for materials and supplies to design and construct a labyrinth on the equator in Ecuador, South America during the summer of 2016. 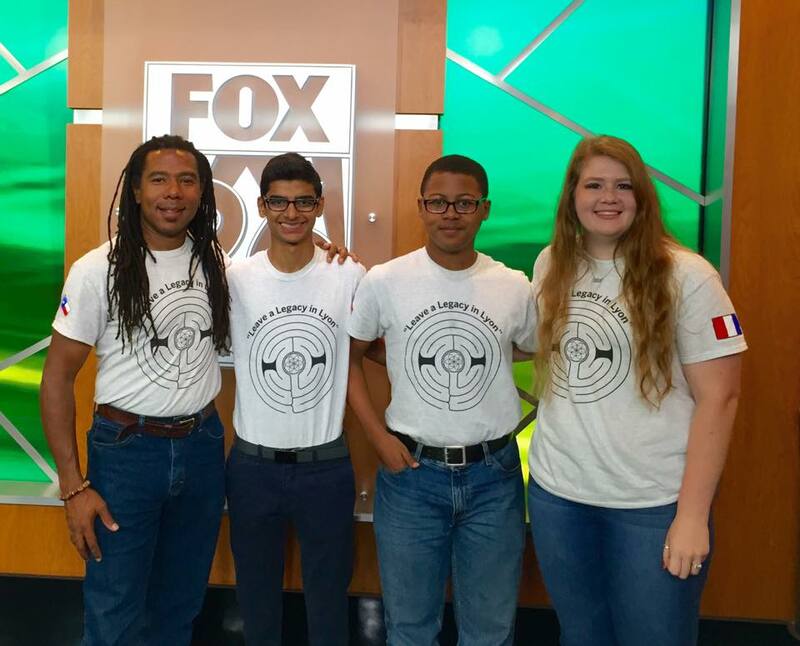 Under the direction of Reginald Adams 18 high school students from the Houston area participated in a 9-month long training, Sacred Sites Quest, designed to prepare them for their labyrinth project in Ecuador. Visit www.ssqie.com for more information about this labyrinth inspired program. Our second grant went to Reginald Adams’s Sacred Spaces Project. Reginald Adams LLC is a public art and design firm in Houston, Texas. This was a very ambitious project in conjunction with International Exchange, a youth exchange program which “engages, empowers and inspires youth through hands-on service projects locally in foreign countries…this collaborative is a multi-disciplinary approach to cultural and social awareness that builds bridges between international communities to address issues of education, environment, urban revitalization, creative place-making and cultural tolerance.” After tours to historic landmarks and cathedrals that have labyrinths, the group of 16 students, working with the local host team, created a 7 circuit classical labyrinth in 4 or 5 days on the ECAM Lyon Graduate School of Engineering. More information and photos are available on the Sacred Sites Quest Facebook Page. Our third project was granted to the NEVLO organization to build the Labyrinth of Armone with a geodesic dome at the center to be erected temporarily at Burning Man in Nevada. One attractive aspect of this project, which met the ‘seed money’ category of Special Projects grants, is the intention of the builder and designer, Gio Coehlo, to continue to build on the project over the next few years. Eventually, he hopes to make it a mobile installation that could be constructed at any event ‘like the TLS Gatherings and other places where labyrinths are (and could be) welcome.’ He hopes to eventually house, in the center dome, a coalition of eco-designers to educate attendees in green and sustainable living. The building of the project at Burning Man was made a good deal more complicated by the dust storms that plagued the area. However, it did go up and, according to Gio, was a rousing success with thousands of people, including families, walking the labyrinth. He was so inspired that, on the way home, he stopped in Tahoe and a couple of other places to build labyrinths out of local rock. We have only just received a few photos from him as he’s still sorting it all out. However, he has a new studio and is now even more excited, if that is possible, to complete a documentary film and pursue his dream of the finalized Labyrinth of Armone. View a short Facebook video of the labyrinth at Burning Man. A labyrinth constructed by community and student volunteers, it is available for use by all those who visit the Presbyterian Student Center, University of Georgia, providing the opportunity to experience the spiritual benefits of walking the labyrinth to a wide segment of the University of Georgia and the Athens-area community. The Mothers Healing Garden organization hosted Lisa Moriarty in Dell Rapids, who conducted a workshop to educate the public on the history and use of Labyrinths. Lisa brought two canvas labyrinths for participants to experience. She also provided a PowerPoint presentation and small group information breakout sessions. The Midwest Regional Gatherings took place at Waycross Conference Center, Morgantown, Indiana. They were opportunities to network with Labyrinth enthusiasts and Facilitators from everywhere, experience a variety of Labyrinths, attend Workshops and Roundtables on many topics, and display and share work in the resource area. TLS member and artist Kelley Quinn worked with the 6th, 7th and 8th graders at this Illinois Middle School to create a public piece that the whole community can use. Quinn, who is a Certified Labyrinth Facilitator, helped the students design a mandala pattern to go under a 7-circuit classical labyrinth, and trained the students how to use the labyrinth and establish a Labyrinth Keeper club to maintain and continue to educate future users for years to come. The Perrine Elementary Expressive Arts Labyrinth project aims to provide an alternative yet innovative approach to helping students focus on solving emotional issues impacting their ability to access their education. The students whose academics are faltering due to their focus on social emotional issue, such as, anger management; lack of impulse control, self-control, self-esteem; and the need to learn self-soothing techniques will have an opportunity to utilize the transformational attributes of a labyrinth. The labyrinth is a reconfiguration of an existing living plant maze-like feature to a classic labyrinth and is also used to help students with critical thinking meditation. The 'Journeys through the Labyrinth' workshop on September 3, 2010, provided an opportunity to learn in depth about the labyrinth and its use as a blueprint for one’s own journey - journeys through work, study, or major life transitions. An offsite venue at the Parliament of the World’s Religions in Melbourne, Australia, December 2009, this labyrinth hosted seven events in the course of the Parliament and was hosted by the Australian region of TLS. Labyrinth Network Northwest (LNN) seeks to improve communication and cooperation between labyrinth-interested people in the Pacific Northwest. 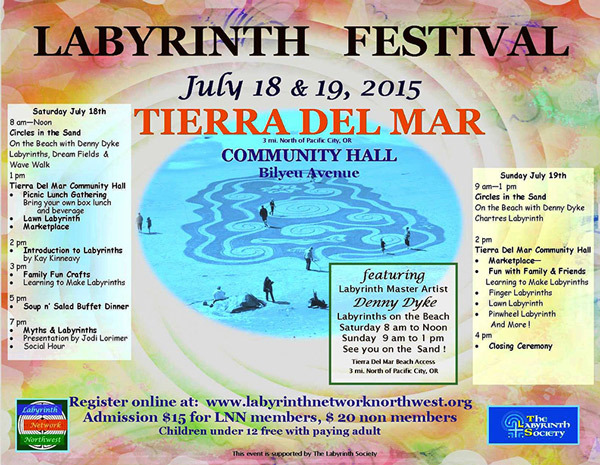 Labyrinth Network Northwest (LNN) is a new organization devoted to supporting activities and practices centered on the labyrinth. It seeks to bring together labyrinth walkers, facilitators, spiritual directors, and craftspeople in the region - all united in their passion for the labyrinth and the possibilities for transformation. These various interests will be connected through a variety of formats, including occasional meetings and - most importantly -- electronic communication to publicize labyrinth programs, consultants, information and labyrinth sharing, workshops, and book groups, to name a few. The Carol Shields Memorial Labyrinth is an outdoor garden labyrinth, commemorating renowned author Carol Shields. It is approximately 150' x 150' located in King's Park, Winnipeg close to the University of Manitoba where she taught and is wheel chair accessible. Sponsored by the Labyrinth Network Northwest, these now annual gatherings in Oregon feature speakers, workshops, fellowship and fun.